I made my second visit to Upton this week. For those of you not in the know, Upton is the new Poundbury. Sort of. It’s an urban extension (fancy modern term for a housing estate), tacked onto the edge of Northampton, and it’s full of weird and wonderful homes. 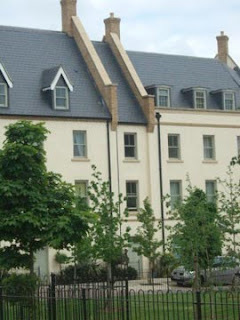 I was there as part of a Princes Foundation seminar group and the guiding hand of this group is evidenced all over the development, though its much more diverse than Poundbury. Although at first glance it looks all very traditional, there are modernist schemes here as well and Bill Dunster’s Zed factory is hard at work on one corner delivering what they claim to be the first Code for Sustainable Homes Level 6 homes onto the market. Only the southern side of the development is complete, the rest is still very much a building site. However, enough is there to give an impression of what it will be like when all 1200 homes are all done and dusted. In many ways, it’s the complete antithesis of selfbuild. Like Poundbury, the whole scheme is about urban design and master planning, building model settlements where everything is thought through and everything hopefully functions smoothly. It’s just as much about social engineering as it is architecture and consequently it all has a rather prissy, manicured feel to it. And whereas the scheme density, the parking restrictions and the pepperpotting of social housing throughout the site doesn’t appear to cause any problems in Poundbury, these issues have all become thorns for the developers trying to woo in private buyers at Upton. By way of example, Slowe indicated that theft of building materials was an ongoing issue on this site. “It’s all very well using lead-lined canopies over the front doors, but the lead keeps getting stripped off.” Just around the corner from Slowe’s houses, I walked straight into the evidence that this was indeed the case – see image. The verdict on the success or otherwise of Upton will be some time in coming, but you have to admire the vision and drive which enabled it all to get out of the ground. Do take a detour to go and visit the scheme and make your own mind up. BTW, it’s not very well signposted. It’s on the western fringe of Northampton, next to the Sixfields football ground, the home of Northampton Town FC. Set your sat nav for NN5 4EZ and it should take you to Upton Square, the pulsing heart of the place, right next to the brand new primary school.